Does anyone have experience or opinions on the SOG Arc Lock? I want to buy a new knife for my EDC, the SOG Spec Elite II. The design appears to be perfect for my purposes and the Arc Lock lets one flip the knife open and shut extremely fast. However, the handle material is Zytel (or plastic). And the Arc Lock has been derided by some as a sneaky way to get past Benchmade's patent on the Axis lock. Many say the blade develops vertical play. My problem is that no other manufacturer I have found offers a knife this large that opens this fast for this price. I know I'm going to regret this so I apologize to everyone in advance but could you tell me what EDC is and just exactly how this knife is "...perfect" for your purposes? You know, the pocket knife you carry everywhere and every day. It's perfect for this purpose because it has a large 5-in blade with a nice shape and nice VG-10 steel. Also it appears to flick open very quickly and the same with closing. Fort Mac is getting to be a dangerous place to live...don't blame ya for the EDC. I used to carry one when I lived downtown,so glad that I moved out of that crap hole..
To tell the truth I would carry a large folder even if I lived in Safe-ville. I have knife fever, I have a new 4" folder and now I want a 5" folder. Any opinions on the Arc lock and blade play? I'd also like to say that carrying a concealed weapon of any kind without a licence is an offense. I only intend to use my knives for tasks such as opening boxes, cutting rope and seat belts in case of emergencies, cutting apples into slices and opening letters. "The design appears to be perfect for my purposes and the Arc Lock lets one flip the knife open and shut extremely fast." Bob, why would the ability of the Arc lock to open and close very fast be an advantage to you? It's fun to whip knives open and shut. I can think of many uses for a knife that needs it to open extremely fast. Anyways that's not the issue. The issue is the durability of the Arc lock. Any opinions? The mechanism will definately open and loosen up over time. I'm not sure I want to be lugging around a 5" blade all day but that's just me. 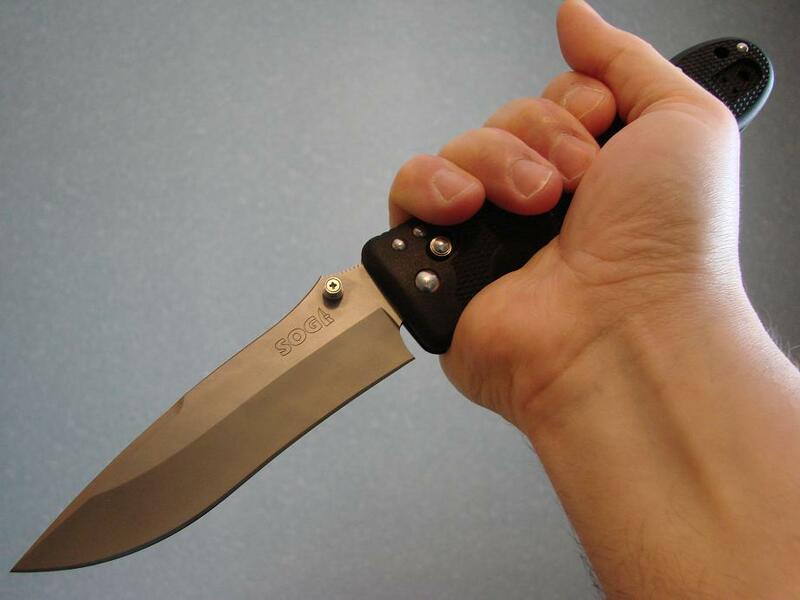 I bought a SOG Tech Bowie a few years ago. It has about a 6-6 1/2" fixed blade. I think that it would be a lot of knife to lug around all day. The one you're looking at is foldable so it might be better. If I wanted a knife to carry all day,I would consider something in about a 3" folding. I'm already carrying 4" and it is unnoticeable so I don't think 1.5 oz more will make much of a difference.